If I subtract last Tuesday, some really good things have happened this week. How can you not have a good day after sharing a donut with Ethan? And why can’t I have his hair? 2. Scooted Ethan and Megan off with Aunt Julie (thank you, Jule!) for a big chunk of the day so Rache and I could go on a date. 3. Took Rachael to lunch and then Target where I found a new planner that’s going to change my life and she swooned over the art section. Finished up with a new, cute short haircut for Rache. It looks darling. 4. Sold our house. Yeah, you read that right. Done. Signed. Inspected. Sold. 5. 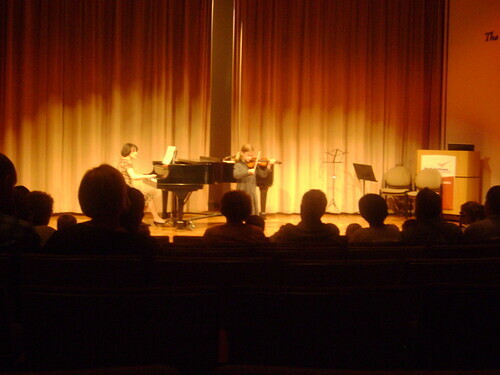 Megan ripped it up in her Spring Violin Recital. So cute. So talented. So proud of her. I know this is a terrible photo. The lighting was awful and I couldn’t get any closer. 6. Went to the temple on Wednesday night with most of my family. Really, really nice. Really, really grateful. 7. Had an absolute, over-the-top blast with our dear friends, the Curtises, who came up to visit us last weekend from SLC (they used to live in our neighborhood.). Should probably document the whole weekend here, but we were having so much fun that neither of us took any pictures. We ate, we swam, we shopped, we movie-d, we talked and talked and talked. Great people, great friends. We still miss them terribly. 8. Reflected on how many good, good friends I’ve made in my life and how the best ones have spanned the years and the miles. So grateful for that. So lucky. 9. Reflected on how many, good, good warnings I’ve received this last month without ever being issued a costly ticket. So grateful for that. So lucky. So regretful that I let my mother hear about it on my blog. So gonna pay for it forever. 10. My darling husband has cancelled all Sunday meetings (besides the block, darn it) so that husbands can stay home with their wives on Mothers Day. Can you believe it? I suspect that French Toast in bed is going to make it into my Mothers day. I am excited. Me : “Really? Okay…” I gave her a quizzical look. My kids have never asked for anything close to a vegetable in their lunches before. I began putting some mini-carrots in a ziploc. Rache: “I mean, since I still don’t have my glasses…I thought the carrots might help…” Hopeful, apologetic smile. She was completely serious. Shame on me for ever having a bad day when I have a little girl like that! And Happy Mothers Day to you all. I missed this one! 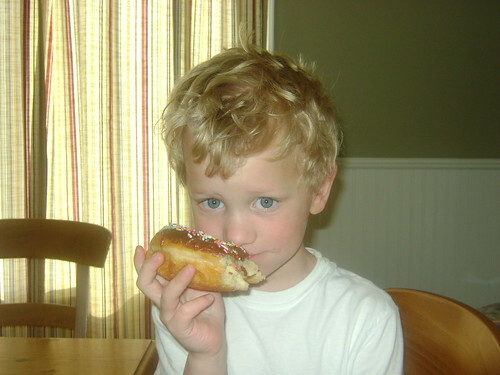 How cute is your little boy? I just love the cute things my girls say just often enough to make my heart swell. It makes up for the other times like two days ago when Jenna said, “I’m going to run a way from home.” I said, “Hey, if you can find another family better than ours, you should do it.” Jenna says, “Don’t laugh. I might just do it!” Cute huh? Glad your empty glass is getting filled!! You are the coolest, Jen. You just are. Good stuff this week! I, too, want to see Rachael’s hair. Congrats on the house selling! What a relief. Where will you live? Congrats on selling your house! Where are you wanting to move?!! I do love Rachael’s hair; it frames her face just so perfectly! You are also counted among several people’s great friends list and thank you for making it at the top of mine. Tell Derrick that I was also very grateful for the cancelled meetings this morning so that I could really sleep in and have a relax-o morning. Where’s a picture of Rachael’s hair? I bet it’s adorable! Happy Mother’s Day! I miss you!